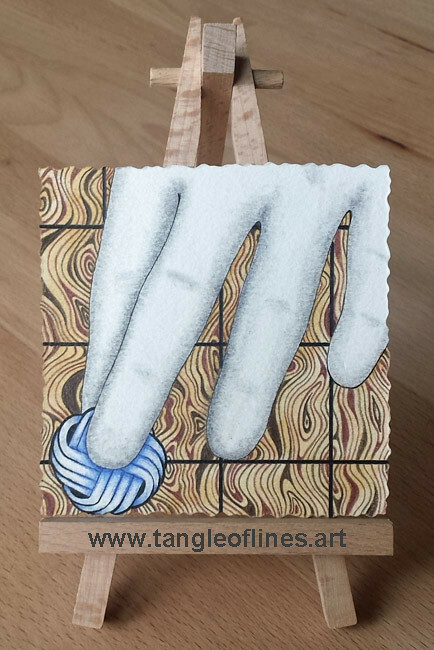 Back in April, the Zentangle Diva Laura Harms issued a challenge called “Finger Stringer”. The task was use our fingers in an “interesting” (thats what she said) way to create a string for us to tangle in. Well, I tried to tackle that challenge. However, I’m not 100% sure if the two tiles I do qualify since I only tangled AROUND my hand. But almost as soon as she wrote the word “interesting” my mind was set to do something that would incorporate my other big hobby next to tangling/drawing: the game of Go (or 囲碁 (jap. igo), 圍棋 (chin. wéiqi) or 바둑 (kor. baduk). Probably you’ve heard from it, there has been QUITE a bit of a ruckus the last two years because AlphaGo revolutioned computer Go and the wayartificial intelligence work. Go basically is a 4,000 year old game originally from China. It’s played by two people alternately playing black and white round pieces on the intersections of a grid of 19×19 lines (other sizes are used, too, especially by beginners). To win you have to surround more free intersections than the other player. To check out the basic rules, click here. It’s such a deep, challenging and interesting game! And, just like in Zentangle, it sometimes allows me to zone out completely as I only focus on the board and the moves being played to find the best possible counter to an opponent’s move (within the range of my poor abilities XD). I’ve been playing for.. almost 15 years now, I think, and it is the only game so far that never gets boring. Especially the second tile is among my all time favourite tiles, I’m really happy how both of them turned out! It’s such a simple and obvious thing to do, but without the Diva I’d never have thought to do it. So, THANKS a lot for the inspiration, Laura! Please also check out the wonderful artwork the Diva and everyone else did for this challenge by going to the Diva’s blog post! This challenge inspired me to “go bigger” and tangle a mosaic of a whole board one day. I already laid it out on one of our Go boards: I’d have to tangle 25 or (rather, to have some kind of border going round) 30 tiles fo that. Wow.. that surely feels like a daunting task! But one step at a time… it might work out. I already picked the game, too, it’ll be Honinbo Shusaku’s famous ear-reddening-game from 1846. Hmm… or maybe an interesting game from my most favourite today’s professional player, Iyama Yuta? Hmmm….. You see, I still have to work out a few things until I can get started! Anyways, I’d just LOVE to hang it in our flat (which since we moved in definitely lacks some pictures on the wall). As soon as I start I’ll keep you up to date with my progress. Giving updates and seeing how I progress here will definitely motivate me to keep going. Posted on 23. June 2018 9. 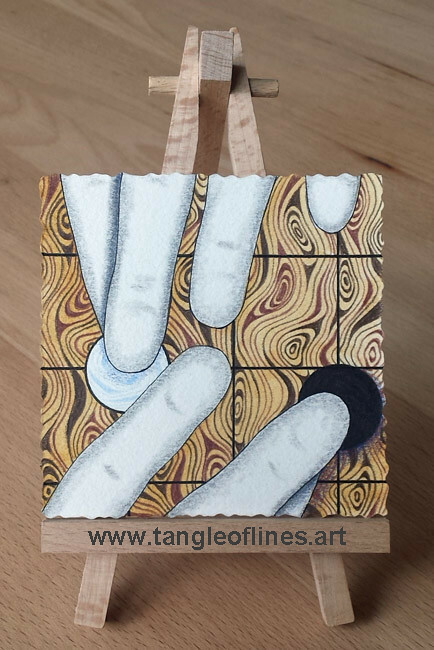 September 2018 by Yvonne LiPosted in board games, challenge, Diva Challenge, the game of Go, Zentangle, Zentangle-Inspired Art (ZIA), Zentangle-inspired-ArtTagged board game, coloured pencil, the game of Go, watercolour, Zentangle, Zentangle-inspired-Art.